Two million Australians visit a GP each week. The late 2018 release of the RACGP General Practice: Health of the Nation report provides a unique overview of the current state of general practice in Australia. The report’s findings provide the most comprehensive summary of RACGP Fellows’ perspectives from all over the country, as well as consolidating other general practice research and government data. The findings draw attention to some interesting trends. 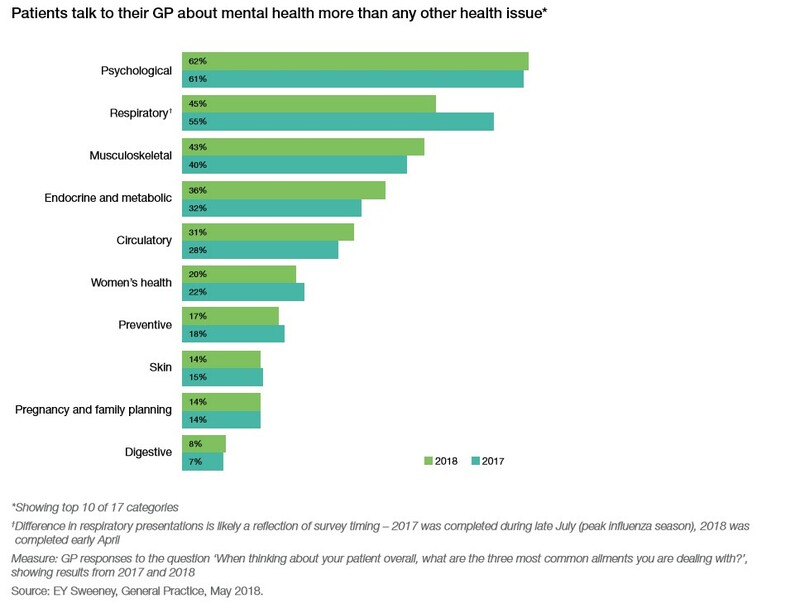 In both of the last two years, mental health issues were the most common reason a patient visited their GP. Psychological issues (e.g. depression, mood disorders, anxiety) were the most commonly managed health issue by a GP in this same period. GPs themselves identify this trend as the issue that most concerns them. While accredited mental health training and CPD programs are available to GPs via the RACGP, general practices need continued support to link their patients to mental health services, particularly as PHNs are commissioning a wide range of community-based services. The report also shows a very small proportion of total government health expenditure is invested in general practice. This persistent finding in the last two years is concerning, particularly considering the rising mental health issues across Australia and clear evidence that countries with strong primary health systems see better health outcomes overall. Another significant finding is that out of pocket costs for visiting a GP increased at double the rate of the CPI, and the growth in bulk billing is slowing. If the current trend continues, bulk billing is predicted to decline by next year. Mental health needs to be a key area of priority and action for both the state and the federal governments. This report is just one of many concurrent indicators of funding changes required. The effectiveness of government spending on mental health is subject to an Inquiry currently being conducted by the Productivity Commission, to determine if the current mental health funding model is delivering the best outcomes for Australians. Victoria is likewise currently undertaking a Royal Commission into Mental Health to guide changes to the state-based service system. Larter is committed to working with local partners and supporting primary care services to help improve the mental health and wellbeing of Australians. Our support includes planning and reviewing mental health business models, writing funding submissions, delivering training, community and stakeholder engagement and developing models of care to improve service access. Contact us if you’d like support tendering or implementing a mental health program in your practice.